Carefully picking his way through the rock strewn tailwaters, the angler casts a 1/8 ounce jig up under the dam. Almost immediately the line heads for deeper water. Carefully the angler retrieves a 2 pound catfish. Catfish on artificial lures? Both flathead and channel catfish will take artificial lures instead of bait. Beginning in late summer as the water temperature gets into the 80’s and low 90’s channel catfish will move to the shallow water up tight against dams. The flatheads will move to the deep holes. In both of these areas, catfish will take an artificial lure. 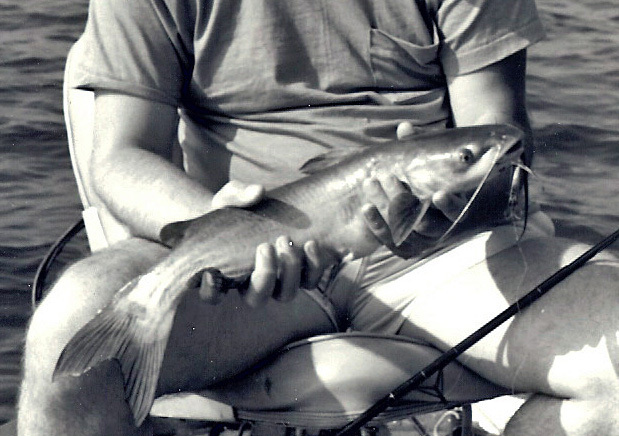 Some experienced catfishermen use bass fishing techniques to catch flatheads. Each September they begin by trolling with a trolling motor on a Jon boat. They troll over deep holes. Most are in the 30 foot depth. Electronics tell them there are fish in the bottoms of the holes. Experience teaches that they are flatheads about to go on a fall feeding spree. They look for structure in the holes. Submerged trees, rock structure or any other kind of “home habitat” that flatheads are known to frequent. The idea is to bounce jigs right on their nose. They use a 2-ounce jig with a salt craw attached. In order for the fish to take it, they maintain that the jig has to be right on top of the fish. Not being a bottom feeder by nature, the flatheads eyes are located to find food slightly above it. Late summer also means low water conditions on most rivers. Cats, be they flathead or channel, seem to seek out deep water, fast running well oxygenated water, or both. Beneath most dams are deep holes created by the water cascading from one level to another. 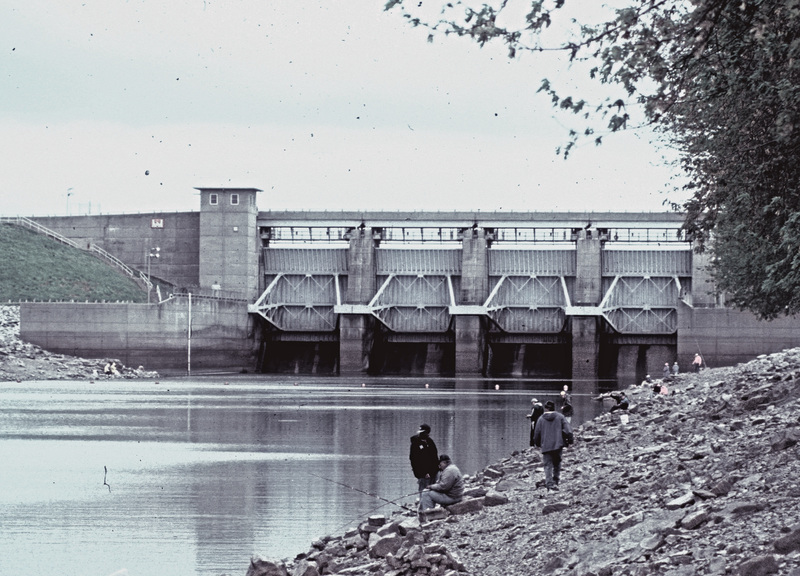 Anglers have long known to cast up under a dam to catch fish. However, few try it with a small jig. A 1/8 ounce leadhead with a dark plastic grub body will do a good job enticing channel catfish. Over on the Ohio River flowage, some anglers use crankbaits to catch fall cats. They get their boats right up in the shallow water at the dam and then cast floating Rapalas. The #13 and #18 are most used. Blue is the preferred color. They use the current to provide action to the lure. Your release is smooth, the flight of the arrow straight, and the sound of the impact on the deer is a familiar thwack. The deer is down, correct? All that remains is to field dress him and get to the processing location. The answer is no on both counts. There is more to do between your release and deer steaks on the grill. Novice hunters seem to think that the deer will fall over upon impact, and some do, but most do not. An arrow kills by massive hemorrhage. During that time the bowhunter has to remain where he is as the deer disappears from sight. Just what is the hunter’s responsibility? First, watch the deer until it stops or vanishes from your vision. Notice where the arrow struck and evaluate the possible mortality of the shot. Notice any marking points where the animal stood when hit and where he was last seen. Observe the animal as it moves off to see if it appears wounded or perhaps untouched. Notice the direction it takes for as long as possible. If it goes down in sight, remain very still and watch to see if it gets up. Even if you see it go down do not move from your position. Many a deer has been lost to over archers who follow wounded deer too soon. Once a deer gets up, no matter how mortally wounded, it can travel milers before succumbing to its wounds. The adrenaline pumps through its system and keeps the animal going beyond their apparent endurance level. If you are not sure of the kill, it is a good idea to check your watch and wait 30 minutes. This can seem an eternity so be sure to use your watch. After the waiting time expires approach the exact impact location and mark it. Tie a piece of cloth or other marker to the nearest brush or tree. Look for the arrow. If present mark its location. Examine the arrow for blood. It can tell you where on the animal it struck and how much penetration might have taken place. It may have fallen out as the deer ran off and will give an idea of the direction of its flight. You can lay the arrow on the ground pointing in the direction the deer fled. You may have to come back to these reference points should you lose the blood trail. Next, look for signs of a blood trail. It can be spots on the ground, bushes, or shrubs. Even tall grasses might have blood on them. Blood that is foamy or bubbly is from the lung area and is surely a mortal wound. Dry lung blood has little circles where the bubbles burst and left a ring. Blood from high back hits has bits of fat in it. From kidney and liver areas the blood is very dark in color. Blood with bits of green gunk in it is from a gut shot animal. This means one should not pursue it for another hour or so. If possible wait until the next day. Gut shot animals run and run if pursued. If not pursued they often will lie down and die. They are not in pain but it takes longer for them to bleed out. Bright red blood that is not foamy is from a leg cut. Leg cuts can sever the femoral artery and the deer can go down quite quickly. If you cannot locate the arrow it is safe to assume it is still in the animal. You may come across it later. Or you may find at least part of it. If a blood trail is apparent then follow it through being careful to mark the trail behind you. In this way if you lose the trail you can go back, see the general direction of flight, and follow the projected path. Mark the trail in two ways. The most popular way to mark a trail is with toilet paper. Be sure to use biodegradable paper or go back later and pick it up. There is enough litter in the woods without you adding to it. Place sheets of paper on twigs or branches wherever you see a blood sign. Soon one can look back along the trail and plainly see the pattern. Another way of marking the trail is to stick an arrow in the ground where you find blood spore. When you run out of arrows, go back to the earliest arrow, pick it up and use it again. As mentioned earlier in looking for blood, do not just look on the ground. It will also be on small trees and twigs against which a fleeing animal might brush. You might have to do some hands and knees looking, but that is all part of the hunt. A good tracker can follow a trail of spots no larger than a pinhead. Other signs in addition to blood might be disturbed leaves, tracks, overturned stones or anything that might look out of place. Wounded animals in flight will tear up an amazing amount of turf in their all out flight. During warm days early in the season, the blood will dry faster and as a consequence will appear as a dark spot on a rock. It is important to pay close attention to everything. On the other hand, late season presents another problem. Deer hair is thicker in cold months. As a result, hair of a bleeding deer soaks up some of the blood leaving not such an obvious trail. As you gain on the deer and the end is near you will notice changes in the appearance of the trail. Blood becomes less noticeable. The ground becomes more likely torn up as the animal stumbles and falls. Once a downed animal is sighted approach it with caution, especially a buck. More than one hunter was gored as he approached a “dead buck” that gets up. He may live to tell the tail but a lengthy recuperation is in the picture. Be very sure any animal is dead before approaching. Do not approach the front of the animal. To be positive an animal is dead throw a stick or stone at it. The tip of an arrow or bow touched to the eye tells the true story. If there is a response such as a blink, then it is still alive. No animal, including humans, can stand to have their eye touched without movement. If the animal is dead, then time has come to take pictures, field dress it and drag the meat out of the woods and place in a cooler or take to the processing plant. Tracking a wounded animal requires patience, being methodical, cautious and through. Never give up. If all signs seem to disappear, sit down and become at one with the woods. Become part of your surroundings and look for something that is out of place. Something does not belong. That is a sign something passed that way recently. Usually that is where you pick up the trail again. There is a natural evolution from bank fishing to stream walking. It is probably due in part to someone getting bored bank fishing when the fish are not biting. Early angling literature almost always focuses on stream fishing. It is just a natural progression from bank angler on a big river to the guy exploring the feeder creeks. Even the fish move from big rivers to find food, security and less angling pressure. All too many anglers miss out on the peace and solitude, not to mention the great fishing found by stream walking. We race up and down rivers in high speed boats with all the gadgets associated with that type of fishing. 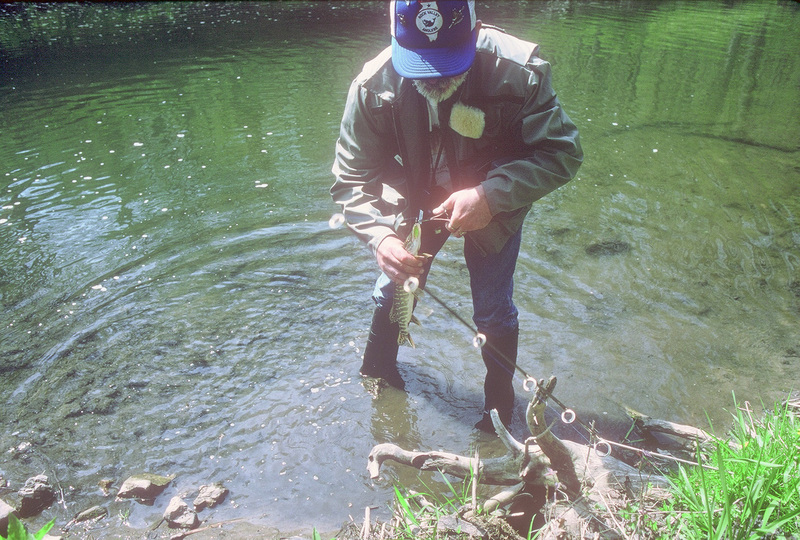 Stream walking can be a matter of wading to another location for better placement of a lure or moving up and down the shoreline to find a better spot. 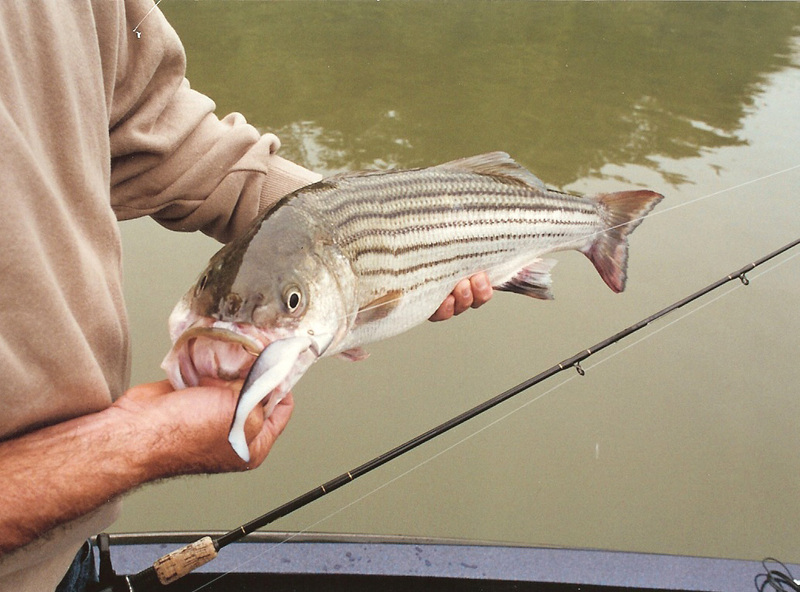 After a heavy rain, or when backwaters otherwise flood, wading provides an opportunity to get fish that have taken advantage of high water to allow them back into creeks to feed. It is possible that a stream walker can blaze a trail into otherwise unknown fishing waters. There is no telling what he might find. Stream walkers use normal tackle with the addition of some more specialize equipment. The first thing they need is a good pair of waders. Chest waders are preferred but hi-p boots are more comfortable in hot weathers and when walking longer distances. If using chest waders it is still advisable to wade no deeper than ones hips. Also important is that you wear a belt on the chest waders. The belt will slow down the flow of water into the waders should you fall into deeper water. Wear the belt outside the waders and is usually coupled with suspenders that come with the waders. Polaroid sunglasses and sun blocker are important to protect you from the elements. The glasses not only protect your eyes but also come in handy in locating fish. They cut the glare off the surface of the water. You can carry tackle in a fanny pack or a ruck sack. Plano has a Lumbar Fishing Pack which is a take-off on the fanny pack but much more efficient. Some people find the fly fishing vest more effective. It was originally a tackle carrier for trout anglers. Contained in the pockets of the vest or in the packs should be such items as a Swiss Army knife or multi-tool, terminal tackle like hooks, lures, lines and sinkers, a camera, hook remover, drinking water, a snack and small first aid kit. The technique for stream walking is simple. One just begins walking upstream and casting to fishy looking places. You walk upstream to avoid disturbing the fish with silt that is stirs up when walking in water. It also helps control the amount of sound that you disperse from walking over rocks and debris on the bottom of the stream. Stream walking is stalking fish. Fish prefer certain structures and different areas at various times of the year. The main idea is to learn a body of water and analyze the shoreline in order to locate fish. Some structure is obvious; downed trees, sand bars, points of land, bends in the creek, undercut banks and large rock formations. You must learn other structure. The angler must constantly analyze the surface of the water, shadows showing depressions or weed growth. In a creek the bottom is subject to frequent change due to flooding or changes in the current. Casting and bouncing a lure along the bottom will locate underwater riffles. This method is good for finding breaks in rocks and variations in the weed line. Stream walking is challenging and takes time, patience and skill. But, it is an interesting change of pace for the angler in search of challenges. Many deer hunters see deer hunting as going to the same area each year and sitting in a tree. They hope for a deer to walk past and that they shoot straight. Successful deer hunting requires study of the quarry, its biology, and the effect that man has had on both. The first deer came to southern Illinois and allowed to reproduce. The idea was to get sufficient numbers to allow the program to move to step II. 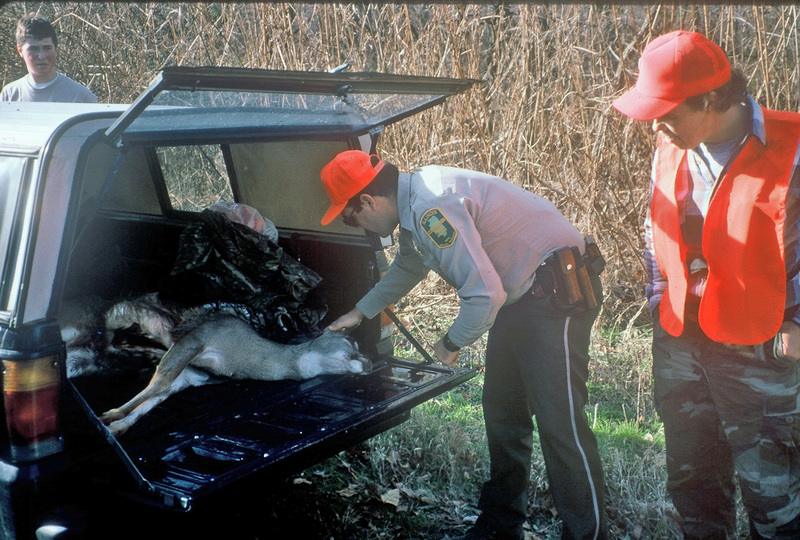 Step II involved the trapping and translocation of deer to a suitable habitat in other parts of the state. This was so successful that by 1957 some 33 counties opened to deer hunting. By 1975, some 98 counties had deer seasons. Step III became the over population that has caused depredation of crops and homeowner landscaping. It also involves an increase in auto-deer accidents on area highways. By the 1980’s over population of deer in many areas of the state was becoming a significant problem. In the 1990’s wildlife officials decided to stress maintenance of deer density that would be capable of sustaining deer hunting. It had to take into account the carrying capacity of the land. 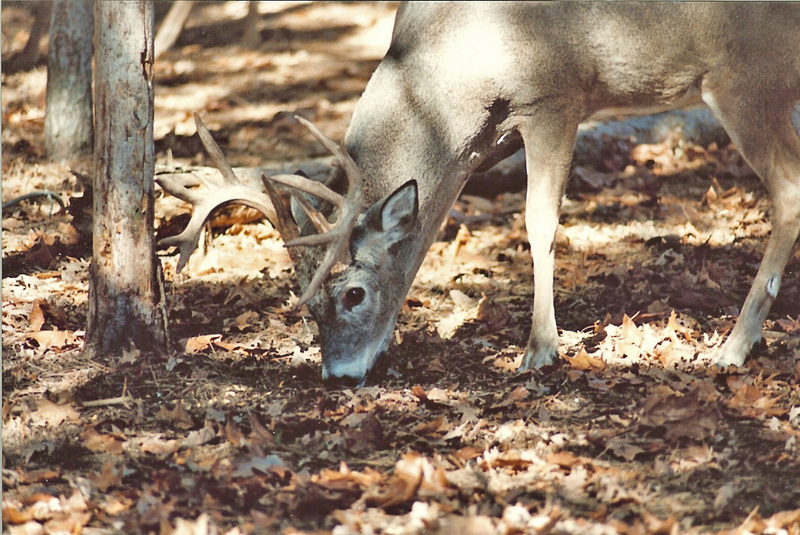 Today there is emphasis in some areas to maintain trophy quality in the deer herd. But, deer hunting is more than just shooting a big deer. Deer hunters seek size and symmetry. First is the preparation and anticipation of a hunt. Some say it is the most fun part of a deer hunt. Then there is the isolation of sitting in a cold treestand waiting for a deer to come past. Finally, there sometimes is the disappointment of being unsuccessful in getting a deer. To the deer hunter these are all part of the game. Deer hunting is about leveraging experience and knowledge. All knowledge is cumulative. The more one hunts, the better hunter he becomes. The more he reads about hunting, he becomes a more informed hunter. The more videos about hunting he views, the more discriminating he is in selecting his quarry. As knowledge accumulates, one sorts out valid theories to test in a specific type of habitat. One tests theories in the field. Then the hunter begins to develop his own theories and test them. That is how one becomes a better hunter. One can always learn if he just keeps an open mind. This year, study your deer hunting area. Does it present the habitat that will attract and keep deer? If deer are present, why are they there and where do they regularly travel. By knowing why deer do what they do, one improves his chances of being able to be in position for that all important shot. The huge expanses of public and private land available in southern Illinois attract hunters. The lack of overcrowding makes the area an excellent place to hunt. 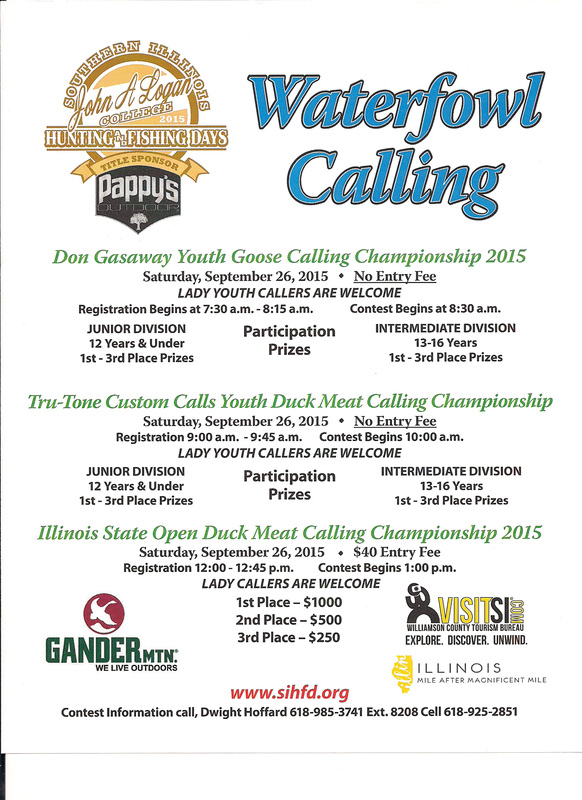 The Illinois Digest of Hunting and Trapping Regulations contains lists of all the public land hunting areas. It is available free from the Illinois Department of Natural Resources offices though out the state. It is also available anywhere place selling hunting and fishing licenses.